The one above is by far the most charming letterbox I know, and I am happy to show a repeat of the image of January 26. 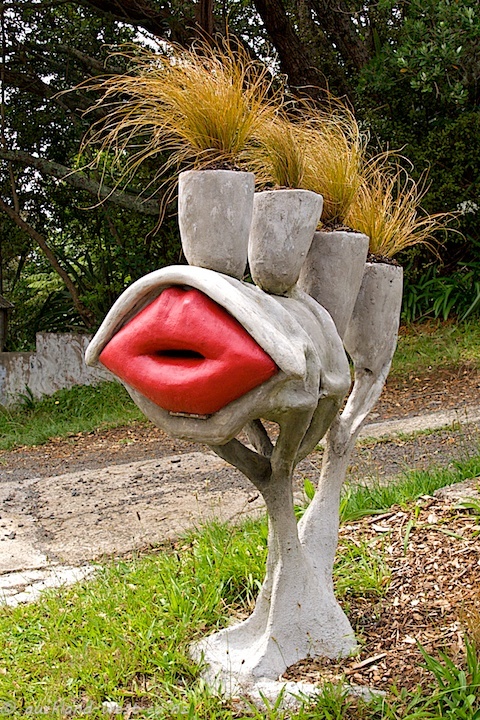 This quirky letterbox at 452 Huia Road, Laingholm, inspired the good people at Kaipara Coast Plant Centre & Sculpture Gardens in Kaukapakapa, to run a design competition for weird and wonderful letterboxes. Long after I had first noticed (and photographed) this ferrocement letterbox, it turned out that Iain Cathcart had designed and built it, and that his mother lives near us. Small world, as they say. Not to be accused of downright lazyness for recycling an old image, I add another mailbox which I found in Wood Bay, Titirangi. Two really interesting, fun mailboxes! I especially like the big red LIPS mailbox! Nice snaps for theme day! The lips box is truly an artwork! Both absolutely brilliant, Mick Jagger came to mind when I saw the ‘lips’ mail box. Fantastic mailboxes, specially the first one!!! That first one is definitely one of the most unique ones I’ve seen, it made me laugh. 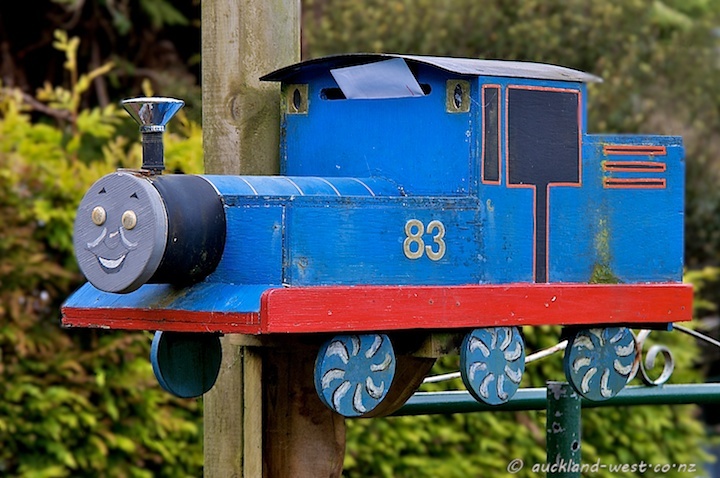 Now these are the kinds of mailboxes I remember from a trip to NZ. I took lots of photos because everyone seemed so creative. That red mouth is a unique mailbox and I want it! That top one is just wild and crazy. I love it. wow , very original !